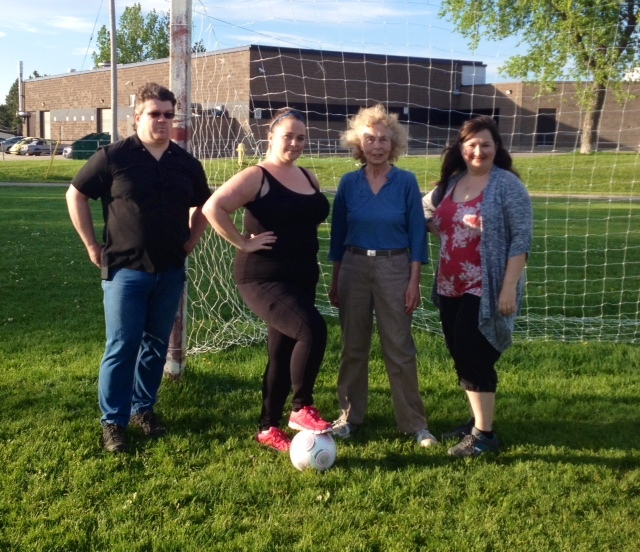 The Tipling Stage Company, Shelburne’s Community Theatre group’s rehearsals are well underway and they are gearing up for their June 12th, 13th and 14th performance at Grace Tipling Hall for their performance of “Secrets of a Soccer Mom” by Kathleen Clark. There are some nifty moves afoot when the moms play the kids…and that’s just the action on the sidelines! Tickets can be purchased at Caravaggio IDA, Shelburne Town Hall, Holmes Appliances & Music Shop and online at www.tiplingstagecompany.com. For reservations call 519 925-3146. Come out and support your local community theatre! Pictured: The soccer moms in action on the pitch. Pictured here from left to right are Michelle White playing the part of Nancy, Daphne Rodaway who plays the part of Alison and Jean Jardine Miller who is playing the part of Lynn. The cast of “Secrets of a Soccer Mom” with their Director Josh Oatman who is making his directing debut. Pictured from left to right are Josh Oatman, Daphey Rodaway, Jean Jardine Miller and Michelle White.